Yesterday Paul and I took our nine-year old granddaughter for a lovely walk at the park. We paused to watch her play on the swings and the monkey bars, enjoying the great feeling of being out in the fresh spring air and sunshine, enjoying nature. We walked slowly by a stand of eucalyptus trees where we often see the monarch butterflies as they overwinter* on their way to Mexico. It’s a little late in the season for them, but we walked expectantly along that path, anyway. The three of us sat on a bench to observe the trees. Suddenly, our granddaughter saw a single monarch! Then another, and another! As one flew overhead, she ran to a fence and jumped up onto the low rung to see it better. She spotted one closeby and then showed us another deep in the leaves, then two together. Soon she had counted sixteen. A beautiful Tiger Swallowtail glided on the wind, just out of reach above our heads. We were delighted by the graceful motion of this large yellow butterfly with its angular wings of yellow and black striped markings. My granddaughter began running after one and then another butterfly, as though she could catch up with them, completely absorbed in the splendor of the moment. After awhile, I shared with her that when I was about her age, one day my mother and I were standing in the backyard and saw a monarch flying near us. My mother then taught me how to beckon it, saying: “Gail, stand very still and silently call the butterfly to you.” She stood quietly, holding her arms out, palms up, and in a moment the butterfly landed on her hand. It sunned its wings, then flew to my hair. As I silently thought of the butterfly, I felt that I was more quiet inside than I had ever before experienced. I remember the subtle sensation of having this magical creature alight on my head, and the delicate touch of its feet when it landed later on my arm. Our granddaughter liked the idea of having a butterfly fly down to her, and opened her arms out hopefully. We both began calling silently to the butterfly, tracking its motions. However, my granddaughter was so excited that she was barely able to stay still for a moment. She would close her eyes and concentrate, then give a small twitch or even a twirl or leap when she looked around again for the butterfly. This continued for some time. As often happens when I’ve done this exercise, a butterfly seemed to take interest in us. It flew down to the ground near where we were standing and rested there for quite some time, its wings becoming muted and almost invisible against the leaves, then brightening again as they opened in the late afternoon sun. Even though the butterfly didn’t land on us, we were completely content to have this close and magical connection. Stand with your feet hip-width apart and your knees soft. Your hands and arms are turned outward (externally rotated), somewhat in front and to the sides of your body, palms forward and elbows bent. I have no idea how my mother learned to call butterflies, but I never questioned the directions she gave me with such clarity. And many people who have learned this activity from me have written to say that they were able to call butterflies to land on them in this way. 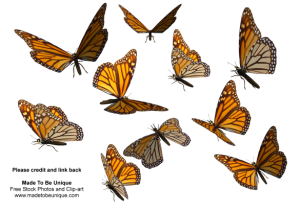 *The monarchs start arriving at the California coast in late September or early October and begin to form clusters by November—a magical sight to behold. The butterflies remain through the winter. They begin mating in February and leave soon after. **From the course manual Movement Dynamics: Including Movement Dynamics: Exploring Three Dimensions and Movement Dynamics Flow Medleys, © 2009 by Gail E. Dennison and Paul E. Dennison. For more information about this course or other Edu-K activities, visit Brain Gym(R) International at www.braingym.org.